Aikido was founded late last century by Morihei Ueshiba, or as he is also known: O' Sensei, (an honorific term for a great teacher). 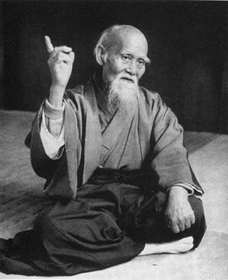 Ueshiba's previous martial arts training started from the traditional study of kenjutsu and kendo, and in the military during the 1900's, during which he studied with the Masakatsu Nakai Dojo learning Yagyu-ryu jujitsu. His devotion further lead him to study Kodokan Judo with Kiyoichi Takagi and later on Daito-ryu jujitsu, with the legendary Sokaku Takeda. O-Sensei was influenced greatly by his relationship with Onisaburo Deguchi and the Omoto-ryu religion. It was while he was with Deguchi, he developed the belief that there was a kinship between Budo and agriculture. Perhaps this explains the oneness that Ueshiba felt with nature and the practice of martial arts. The first signs of Aikido showed when Ueshiba became so absorbed in the study of kotodama and it's deep and complex meaning of the soul and the universe. He departed from his familar Yagyu-ryu and Daito-ryu jujitsu backround styles, and he proceded to try to converge the mind, body, and the spirit into a martial art of his own. By breaking down the walls that often split the three entities apart, Ueshiba was laying down the familiar triangular framework of Aikido. This early style of Aikido was first named aiki-bujitsu. Later, Ueshiba handily defeated a master of kendo, attributing his victory to being able to feel the direction of the kendoist's sword movements. This experience of awareness of the self and the universe so moved him that he decided a more appropriate name would be aiki-budo, rather than aiki-bujitsu. As time went on, Ueshiba intensively devoted himself to his martial art taking on the practice of the spear and particularly kendo. He so absorbed weaponry that it beame almost an appendage to his body. His mastery in sword and staff is legendary. Ueshiba's reputation grew and with this came requests from Admirals, royalty, and military for his knowledge and skills. He taught many high military officals of the army and navy. His skills were so famous that they extended to Manchuria! It was later during the 1940's, Aiki-budo was given the name of Aikido , and by this time Ueshiba had developed Aikido into a martial art unifying the mind, body, and spirit. He taught that it was every martial artist's personal responsibility to preserve life and peace in the universe, rather than to fight. Raised in Tochigi Prefecture in Japan, Toyoda began training at age 10 with his first teacher Koichi Tohei, whose family land neighbored that of the Toyoda family. Toyoda was awarded the rank of shodan at age 17, during a test administered by the late Morihiro Saito. At age 17, he also began training in the misogi methods taught at the Ichikukai Dojo in Tokyo. Toyoda would go on to live for three years at Ichikukai as a resident student, or jyoju. It was here that he began studying Zen as well. Toyoda later enrolled as uchideshi at Aikikai Hombu Dojo in Tokyo, and lived there for over two years. In 1974, when Koichi Tohei split off from the Aikikai Foundation to eventually form his Ki no Kenkyukai (Ki Society), Toyoda followed. In that same year - now 27 years old and holding the rank of godan - he was sent by Tohei to Chicago, USA. Tohei would eventually promote him to the rank of rokudan. Disagreements between the two, however, led to Toyoda's departure from Tohei's organization. In 1984 Toyoda founded his own Chicago-based organization, the Aikido Association of America. Now independent and traveling extensively to lead seminars, a network of European students would also grow to form a sister organization, Aikido Association International. AAA/AAI would eventually re-affiliate with Aikikai Hombu Dojo in 1994. In 1997, Toyoda was given inka shomei, the certification of completion of his training in Rinzai Zen, by the late Tenshin Tanouye Roshi of Chozen-ji temple in Honolulu, Hawaii; the dharma name awarded was "Tenzan Gensei". Toyoda was active promoting Zen training in his network of Aikido dojo. For many years in Chicago he headed a betsuin (branch temple) of Chozen-ji, as well as International Zen Dojo Sogenkai, a lay Zen organization he founded to promulgate the teachings of the late Zen master, swordsman and calligrapher Omori Sogen. AAA and AAI continue to be active today, as affiliates of Aikikai Hombu Dojo in Japan under the guidance of Yasuo Kobayashi. Several other martial art organizations and schools, founded by Toyoda's senior students after his death, are also active. The Zen organizations Toyoda helped build eventually coalesced to form Daiyuzenji, a Rinzai Zen temple still active in Chicago. Derek Kazuo Nakagawa Sensei currently holds the rank of Rokudan (6th degree black belt) in aikido. He has been practicing martial arts for over 30 years. 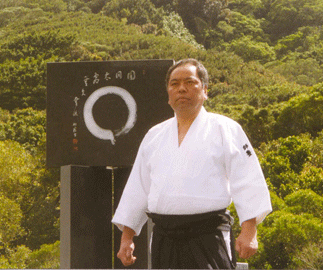 Nakagawa Sensei was a student of Fumio Toyoda Shihan until he passed away in 2001. In November of 2000 he opened Aikido of Rossmoor. He can be seen instructing at various seminars throughout the world. 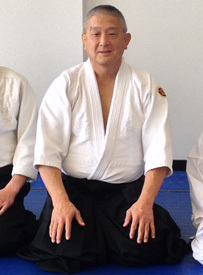 In addition to aikido, Nakagawa Sensei is a shodan in iaido and a first degree black belt in Brazilian Jiu Jitsu under Master Carlos Gracie, Jr. He has competed in Brazilian Jiu Jitsu tournaments. In 2007 he won a silver medal in the Pan Jiu Jitsu Championships and he won a bronze medal in the American National Jiu Jitsu Championships. In 2012 he won two gold medals at the Master and Senior World Championships. Most recently, Nakagawa sensei won two gold medals at the 2013 No Gi World Championships.